WHAT’S INSIDE Welcome to your new Back Pages. From Sports Plus to student work, and hockey umpiring to football coaching, this issue is packed with articles I hope you find engaging and inspiring as we seek to reach the world of sport for Christ together. Happy reading! For more information on who we are and how we can help you, please get in touch, we’d love to hear from you. 01869 255 630 / info@christiansinsport.org.uk / christiansinsport.org.uk Frampton House, Unit D1, Telford Road Industrial Estate, Bicester, OX26 4LD Registered Charity number for England and Wales 1086570 Registered Charity number for Scotland SC045299. DIRECTOR’S MESSAGE The season that never ends Late September is the time when summer sports reach the end of their season offering a chance to rest, reflect and start planning next year’s targets. For winter sports, the season is still young enough for all to dream of success. The season may end formally but in reality we are always in season, using our imagination to plan the next game or the next strategy as we look for that competitive edge. better. And our competitive nature as Christians in sport means that we can always strive to find ways to pass on the good news of Jesus to our teammates and colleagues, as well as developing plans for our sporting performance. The early Christian leader Paul ended a letter to Timothy, a young man he was mentoring for leadership, with these words: “I give you this charge: Preach the word; be prepared in season and out of season…” There is never an off-season for the good news. Let’s be prepared every day to find ways to pass it on in our world of sport. 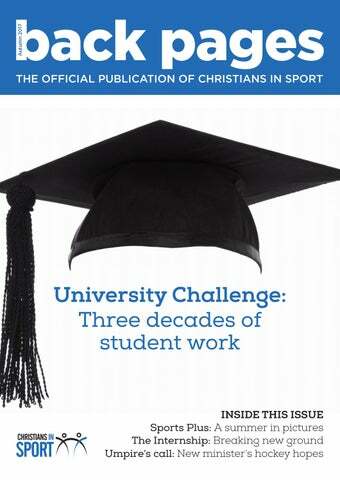 UNIVERSITY CHALLENGE: THREE DECADES OF STUDENT WORK The nature of our student work has evolved over the years, but it remains a key part of our mission to reach the world of sport for Christ. British Universities and Colleges Sport (BUCS) runs competitions for more than 5,800 teams every year, while two thirds of students play sport at university. EM: What challenges did you face? encouragements? DMJ: I came to faith through the Christians in Sport group! You saw people seeking to share Christ across a whole variety of different sports, people having the courage to invite their friends along. Our termly events would pretty much have 100 people. Seeing a handful of people profess faith in Christ, that’s the best encouragement there is. RB: In the second year, we had a really big drive to get people to come to the new year conference. We got a big group together. When we came back, it felt like we were a tighter unit. Everyone had a bit more training and got the vision. It really felt like we were reaching the world of sport for Christ together. OB: It was one of the first examples for me of all-of-life mission and it really had an impact. It often led to great conversations and we had 150 people at one dinner where Alex Harris [past Student Team Leader] came to speak. 14 or 15 years on, it’s good to see many of those people still going well in the Lord. exposure to local church life and the opportunity to serve there as well as being supported by our regional staff. The new programme also offers greater flexibility than before. Interns competing at a high level of sport can be based where they need to be for training, while others can commit to an area they are particularly passionate about. This year, eight new Interns are joining Jen Harris, who is starting a second year on the scheme in Edinburgh. Here’s your chance to meet the eight newcomers. Name: Phil Small Sport: Rugby Union Location and church: Belfast, First Ahoghill Presbyterian Church Prayer for the year: My prayer is that I will grow closer to Jesus and, as a result, become more passionate about reaching people, specifically sports people with the monumental news of the gospel. Name: Vanessa Kelada Sport: Cricket Location and church: Dublin, Christ City Church Prayer for the year: I pray that Christians in Sport can be well received and have an impact in Dublin, like it has all over the world. Name: Hannah Smith Sport: Ultimate Frisbee Location and church: Bristol, Emmanuel City Centre Church Prayer for the year: That God would continue to challenge and shape us for His glory and that I personally would not be ashamed of the gospel as I seek to pray, play, say within my club in Bristol. 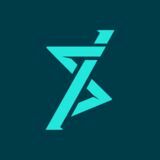 Name: Craig Bathgate Sport: Triathlon Location and church: Glasgow, St Silas Church Prayer for the year: That we would see an uprising of Christian sports players in Scotland, who are passionate about living out their faith in their sports teams and clubs. Name: Jack Shepherd Sport: Golf Location and church: Bicester, The The Source, Brackley Prayer for the year: That God would use me to share the gospel with those in my world of sport, and that through the Internship I can equip and encourage Christian sportspeople to do the same. Name: Rob Stileman Sport: Cricket Location and church: Bicester, The Source, Brackley Prayer for the year: That God will use me and the other Interns massively in growing His kingdom in the world of sport. Name: Vusa Mtunzi Sport: Rugby Location and church: Jersey, Town Church Prayer for the year: That my influence as a Christian in sport in Jersey will provide opportunities for people to know about Jesus Christ, our Saviour. Name: Jos Edwards Sport: Rugby Union Location and church: London, Dundonald Church Prayer for the year: That the Lord increases my hunger to know more of Him and see Him use me in my new rugby club to make Him known and glorify His name. Name: Gail Redmond Age: 38 Where from: Belfast, Northern Ireland Church: Carrickfergus Elim Sporting involvement: Women’s Domestic Manager at the Irish Football Association, a player for Glentoran Ladies and coach Northern Ireland under 15 girls. Sporting highlights: Captaining Northern Ireland, being a freshman All American player at the University of Southern Mississippi and playing in three Women’s Champions League qualifying rounds. What is your most embarrassing moment in sport? I scored an epic own goal in the Algarve Cup against Portugal (probably the best goal I have ever scored)! thought you would go and opportunities to share with people you never thought you would meet. Over time the biggest encouragement I have seen is God’s faithfulness in all these situations. What do you find tough about living as a Christian in your sport? The biggest challenge for me is balance. It’s a real joy to read God’s word and meet with other Christians, but it’s so easy to push your quiet time to the side or skip church for a coaches meeting or training. How do you look to share the gospel in your sporting role? I try to be intentional about making time to get to know teammates and fellow coaches; praying for opportunities to share about what God has done in my life. What one piece of advice would you give to Christian sportspeople to help them share their faith? I really do believe the saying “people don’t care what you say until they know you care”. Invest in people and share the greatest message ever! Christ died to forgive us of all our sins and give us an abundant life! FAIRWAY TO HEAVEN Reaching the world of sport for Christ is why we exist. That’s harder to do in some places than others, such as professional golf tours where players spend so much time away from home. For the few players who are Christians, it is hard to get to church and enjoy fellowship with other believers. For those looking to investigate Jesus, there is not an obvious place to turn. This is where Christians in Sport can step in. While a minister-in-training in Bewdley, Worcestershire, Tom joined the Midlands Region Hockey Umpires Association and umpired a couple of men’s Premier division games. “I’m just about reaching the limit of what I can do with my qualification and I would love to go higher,” he explained. Off the pitch, Tom has had some great opportunities to share his faith with other umpires and players. “At regional level, you generally meet your umpiring colleague an hour before the game, usually someone you’ve never met before, and inevitably the question of what you do for a living comes up. “It’s brilliant having an opportunity to say I’m a Baptist minister as that often leads to conversations about my faith, and my beliefs about all sorts of topical faith-related issues.” Balancing ministry and umpiring doesn’t just happen off the pitch though, as one of Tom’s assessment feedback reports suggested he may like “to stop being so much of a Christian” when umpiring, especially when dealing with conflict. I could go further with my umpiring than I could as a player. I decided to sacrifice playing to pursue my umpiring career, and soon gained my level two regional qualification.” While doing an undergraduate degree at London School of Theology, Tom was put on the National Young Umpires Promising List and had the opportunity to umpire junior tournaments at national level. The official magazine of Christians in Sport.